Add a decidedly feminine touch to all your personal correspondence. 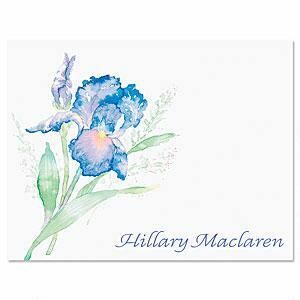 A beautiful iris in full bloom graces the front of these blank-inside note cards. White envelopes. Note Cards come in gift packaging. 4 1/4" x 5 1/2". Specify 1 line, up to 24 characters and spaces.